Type X Silicon Carbide Presolar Grains: Type Ia Supernova Condensates? In terms of nucleosynthesis issues alone, we demonstrate that the type X silicon carbide particles have chemical and isotopic compositions resembling those from explosive helium burning in 14N-rich matter. These particles are extracted chemically from meteorites and were once interstellar particles. They have already been identifed by their discoverers as supernova particles on the basis of their isotopic composi-tions, but we argue that they are from supernovae of Type Ia that explode with a cap of helium atop their CO structure. The relative abundances of the isotopes of C and Si and trace N, Mg, and Ca match those in the X particles without need of complicated and arbitrary mixing postulates. 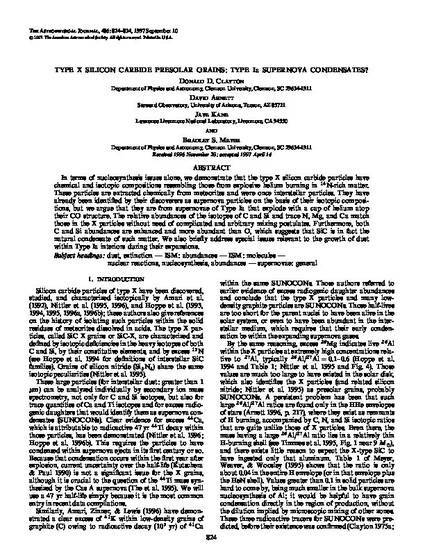 Furthermore, both C and Si abundances are enhanced and more abundant than O, which suggests that SiC is in fact the natural condensate of such matter. We also briefly address special issues relevant to the growth of dust within Type Ia interiors during their expansions.